Egypt has been following in the footsteps of their North African neighbors in Tunisia by taking it to the streets with the goal of overthrowing a long-serving despot. Hosni Mubarak has been at Egypt’s helm since the assassination of his predecessor, Anwar Sadat in the October of 1981. 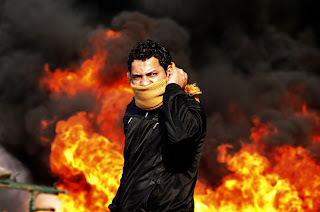 The ruling Egyptian opposition party, the Muslim Brotherhood, is outlawed but has been coming out in en masse to support protests, which as we speak, are torching police stations in Cairo. The military has imposed an evening curfew on all Egyptian cities, but according to CNN’s Ben Wedeman, tens of thousands of angry Egyptians are defying these orders with extreme prejudice. After the fall of Tunis, plenty of Middle Eastern observers speculated that the spark that light their revolutionary fire could spread. That appears to be what we’re seeing in Egypt. Israeli officials, always observing their neighbors to the South, speculate that although these protests will cost Mubarak greatly, he has the military force to impose a solution. Al Jazeera (whose Egyptian offices have been closed by force according to the networks head of new media) are reporting that protests have spread to Jordan, where thousands of reinvigorated protesters are demanding that their Prime Minister steps down. Additionally, tens of thousands of protesters have taken to the streets of Yemen’s capital, demanding the resignation of President Ali Abdullah Saleh after 30 years of power. Following the fall of Tunis, the speculation was that any follow-up movements would attack the pro-Western dictators throughout the region. With Egypt and Jordan and even Yemen on the brink, the big question is: how much longer can this trend continue without spreading to Saudi Arabia?